ACP would like to announce its cooperation with one of the latest additions (the tournament was first organised in 2014) to the open European circuite, the Sunway Sitges International Chess Festival. The tournament will be held from December 14-23 in the beautiful Hotel Sunway Playa Golf&Spa Sitges. 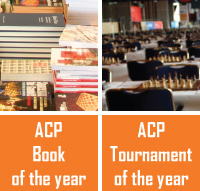 The impressive prize fund of 25 000 EUR has a first prize set at 5000 EUR, making it very attractive for all players. The cooperation with ACP includes full board for two of our Premiums rated 2650+. This also applies to their families, if they desire to come along. In some cases also a free transfer from and to the airport can be arranged. We hope to have good cooperation with the Sitges tournament and ACP Premiums rated 2650+ are welcome to contact the ACP Board to confirm their interest.